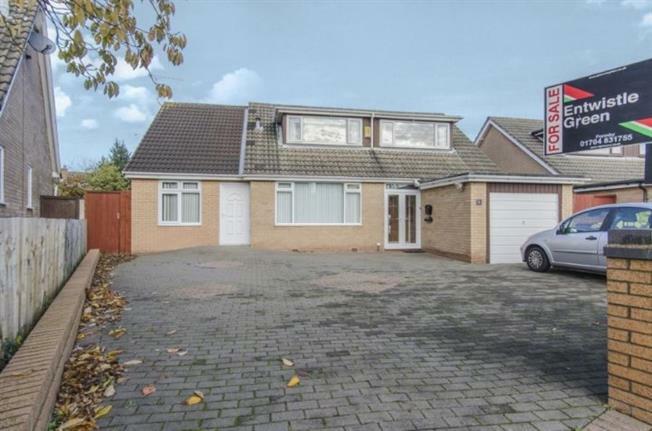 4 Bedroom Detached House For Sale in Liverpool for Asking Price £324,950. Entwistle Green are pleased to offer for sale this attractive three/four bedroom property situated in the popular residential location of Formby with its shops, school and amenities available within close proximity. The property comprises; entrance hall, reception room, kitchen/diner, downstairs WC, cloakroom and utility room. The property benefits from an annexe extension adjoining the property with its own front door. The annexe comprises; bedroom, reception room and wet room. To the first floor of the property there are three bedrooms and a bathroom. The property is centrally heated, double glazed throughout, has off road parking, a garage and gardens to front and rear. Viewing is highly recommended. Double glazed uPVC window and front door. Gas fire and surround. Two radiators. Laminate flooring. Double glazed uPVC window. Fitted wall and base and drawer units. Laminate work surfaces. Integrated double oven, hob and hood. Microwave. Fridge and freezer. Tiled floor. Spotlights. Double glazed uPVC window and door. Plumbed for dishwasher. Plumbed for washing machine and dryer. Wall and base units. Vinyl flooring. WC and basin. Double glazed uPVC window. Double glazed uPVC window. Laminate floor. Double glazed uPVC window. Radiator. Laminate flooring. Disabled bath and shower. Double glazed uPVC frosted window. Tiled floors. Access to boarded loft. Double glazed uPVC window. Double glazed uPVC window. Radiator. Eaves storage. Four piece, white suite comprising; bath, shower cubicle, basin, WC, double glazed uPVC window. Radiator.